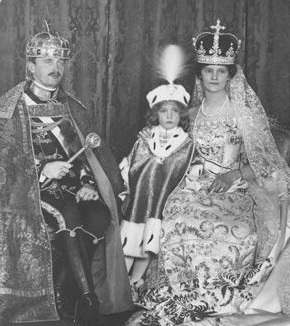 Otto von Habsburg, aged four, attends the coronation in 1916 of his father, (already proclaimed Emperor of Austria), as King of Hungary, too. Known also as the Blessed Charles of Austria, he was a member of the Order of Malta with the rank of Bailiff Grand Cross of Honour and Devotion. There are moves to get his wife, Servant of God Empress Zita, beatified, as well. How did this happen? The Order of Malta’s entrenchment in the new country had more than a little to do with a picnic. This curious outing was was sponsored by none other than Otto von Habsburg, a royal exile who had never renounced his claims to the thrones of both Austria and Hungary. “There had been signs of Hungary’s quiet departure from the camp of the Warsaw Pact states for years. But neither Hungary’s allies nor the NATO countries took these signals seriously.”  Apparently, however, the Vatican did. In December 1988, after the longtime Communist chief stepped down and strikes in Poland emboldened the Hungarians, the Order of Malta prepared itself for an opening. Baroness Csilla von Boeselager, a Dame of Malta who was active in the German Malteser Hilfsdienst, established a branch of the German aid group in Hungary until it became possible in February of the next year for Father Imre Kozma, a priest in Budapest, to found the Hungarian Malteser Charity Service (Magyar Máltai Szeretetszolgálat or MMSZ). Thus everything was in place by the time the weather was right (in all senses) for the political picnic of August 19, 1989. A picnic that changed the world. A German-language flyer had turned up out of nowhere, with a picture of barbed wire enclosing a stylized rose (a Marian symbol, which hinted at its origin). This gave driving directions to the picnic and also a map showing the location of the Austrian border, 2 kilometers north of the picnic site. Otto von Habsburg’s political picnic was a brilliant move. In the space of a few hours it delivered a blow to the Kremlin before the whole world. It also established the credibility of the Order of Malta in post-Communist Hungary. This agreement puts much of Hungary’s largest social assistance provider under Vatican control, for the SMOM is accountable only to the pope. Yet, as stipulated by the first article in the Vatican Finance Concordat, the state is required to subsidise Church-administered services equally with those of the state. As an “international cooperation agreement” it falls under international treaty law. This means that it cannot be unilaterally revised by the Hungarian parliament. The nation has effectively relinquished control over many of its social services to the Vatican. According to the “Cooperation Agreement” below, Hungary can no longer change even the delivery of these social services without Vatican consent (Art. 10) It can only cancel the treaty as a whole (Art. 11.3) ― and risk plunging the country into a medical and social crisis. In Hungary the state-subsidised social services now depend heavily upon provisions negotiated with the Vatican, which has its own social agenda of “life at all costs”. (b) “Appointed organizations” means the Hungarian Association of the Knights of Malta, the Hungarian Maltese Charity Service Association, Hungarian Foundation of the Knights of Malta, the Hungarian Maltese Charity Service Foundation, as well as the Hungarian Maltese Charity Service School Foundation. The Contracting Parties - in additional protocols - may agree upon further entities to be considered as appointed organizations for the purposes of the present Agreement. (c) “Special arrangement” means a written agreement concluded between an appointed organization of the Sovereign Order of Malta and the competent Hungarian authorities. 1. The objective of the present Agreement is to set up the general framework and guidelines for the future cooperation between the Contracting Parties in the field of social, health or humanitarian services and of international development, laid down in additional protocols by the Contracting Parties or in special arrangements between an appointed organization and the competent Hungarian authority. 2. All activities covered by this Agreement and realized within the framework of short-term or longterm projects, plans or special arrangements remain under the scope of this Agreement. 1. Subject to their means and possibilities, the Contracting Parties will support and implement measures intended to facilitate, develop and diversify their social, humanitarian, health and international development cooperation, as well as steps aimed at the expansion of such activities to related fields. 2. The Contracting Parties will study the specific projects approved by them within the framework of their cooperation and will assist the realization of such projects as effectively as possible. 1. The appointed organizations - in the field of their activities and within the framework of this Agreement, - shall have the right to consult and negotiate with competent Hungarian authorities, unless the Government of the Republic of Hungary expresses its objection. 2. The appointed organizations may carry out all activities concerning education, cultural and social development, health care, disaster relief, sport, and the protection of children and the youth that are not reserved by effect of national legislation exclusively for the Hungarian State, its state organs or institutions. Within the framework of these activities, the appointed organization may establish and maintain services and institutions and carry out projects. 3. The appointed organizations - on the basis of special arrangements concluded with the competent Hungarian authorities and in accordance with the relevant laws and regulations - may take part in the execution of the public tasks referred to in paragraph 2. 4. For the effective implementation of the tasks arising from the present Agreement, the Sovereign Order of Malta and its appointed organizations shall cooperate with the State and local authorities and organizations involved in the execution of the mentioned tasks. 1. The appointed organizations of the Sovereign Order of Malta carrying out public services in Hungary - for the purposes of providing regular subsidy and ecclesiastic supplementary subsidy - shall be considered as religious institution operators in the meaning applied by the relevant laws and regulations applicable to churches and the financial conditions of the religious and public activities of the churches. Regular subsidy and ecclesiastic supplementary subsidy is provided to the above-named appointed organizations according to the rules and procedures applicable to religious institution operators. 2. According to the Hungarian laws and regulations, private individuals may donate the one percent (1%) of their income tax to the appointed organizations as well as to public benefit organizations and prominently public benefit organizations established by them. (b) long-term free use of real property. In the case of each supporting measure, the competent State or local authorities and the given appointed organization of the Sovereign Order of Malta conclude a special arrangement. 2. Within the framework provided by international law, the Contracting Parties mutually guarantee effective protection against the abuse of the name, flag, coat of arms and other insignia of one another. 1. With respect to importation of goods, the Sovereign Order of Malta and its appointed organizations enjoy tax exemption and relief from customs duty according to the relevant rules of the European Union. 2. The appointed organizations of the Sovereign Order of Malta shall be exempt from duties. The Republic of Hungary shall facilitate the issuance of entry visas, residence and work permits to the foreign personnel of the Sovereign Order of Malta and its appointed organizations contributing to the implementation of social, health care, humanitarian or international development operations. 1. In order to ensure proper follow-up of the cooperation, the Contracting Parties set up a Reflection and Assessment Committee to examine and choose the joint tasks and plans necessary for the realization of the objectives set out in the present Agreement. To this effect, the Committee shall set out future projects, identify their goals, and submit the annual report to the Contracting Parties. The annual report shall include i.a. an account of the work accomplished, the planned and realized projects, as well as their assessment. (c) the representatives of the appointed organizations of the Sovereign Order of Malta. 3. The Committee shall meet at least once a year. Differences of opinion in the interpretation or implementation of the present Agreement shall be settled by negotiation between the Contracting Parties. 2. This Agreement shall enter into force on the first day of the month following the date of receipt of the last written notice by which the Contracting Parties have notified each other, through diplomatic channels, that their internal legal procedures necessary for its entry into force have been completed. 3. Either Contracting Party may terminate this Agreement at any time by written notice to the other Contracting Party, through diplomatic channels. In such cases, the Agreement shall terminate ninety (90) days from the date of receipt of the notice of termination by the other Contracting Party. 4. The termination of this Agreement shall not affect the completion of any activity undertaken under this Agreement and not fully completed at the time of its termination, unless the Contracting Parties agree otherwise. Done at Budapest, this 3rd day of November 2010, in duplicate, in the English and Hungarian languages, both texts being equally authentic.